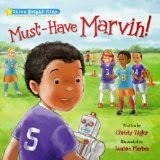 I'm happy to say Rebekah is the winner in my Must-Have Marvin! book give-away! (You'll find the review at this link) Thank you Rebekah for reading About the Children's Department, (please email me your address so I can have it sent to you) and thank you ideals children's books for sending one for me to review and for making another available for me to give away!